Hello Nosh Show listeners! Things are a little backed up here so I'm going to combine two announcements in this post. First, have you seen DQBlizzardBattle.com yet? Over labor day weekend, I let you know that there was a tasty new Apple blizzard in town (review here) and that the tasty pumpkin pie blizzard was back early. Little did I know that it was actually going to be this big September event going on. 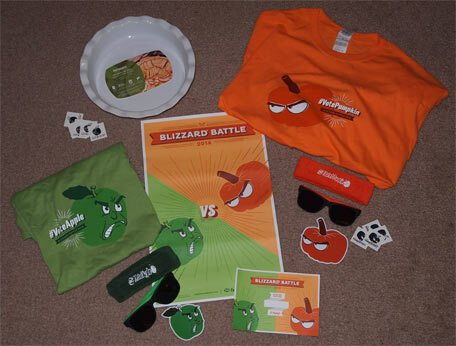 DQ's PR firm contacted me last week and offered to send the awesome gift pack pictured below (plus two $5 gift cards to retry the blizzards). I've put some serious thought in to this and I'm still not sure which side to pick. I don't know if I should #VotePumpkin or #VoteApple. I've always loved the pumpkin blizzard, but the apple pie blizzard really hit the spot.... ok, I'm probably leaning towards pumpkin. I need to get to DQ and try them one more time to be sure. Thanks again to DQ for the stuff, my son has been having a blast with all of it. Remember, you only have until the end of September to try the new apple pie blizzard. Now get to the website and vote! Ok, I went to DQ and got a mini of each. Apple is good, but Pumpkin is great. #VotePumpkin! Alright, enough rambling, it's resting time. Have a good week everyone! I had to vote for Appple! he is a WA state (wenatchee) apple! Out of curiosity, have you ever had any success freezing soft serve style ice cream or blizzards and then eating them later?? I haven't had success either :/ alas, was hoping you had some amazing secret!